Planning a party? Conceiving a cookout? Deciding to dine outdoors? Look no further than this marvelous gazebo! This gazebo's large size makes it perfect for parties or entertaining, set up a buffet underneath and you've now got an excellent place to mingle. Or pack the ample space with comfy outdoor lounge furniture and enjoy cocktails, coffee or a casual brunch in the fresh air. Define your outdoor living space with this gorgeous LED-lit garden structure. 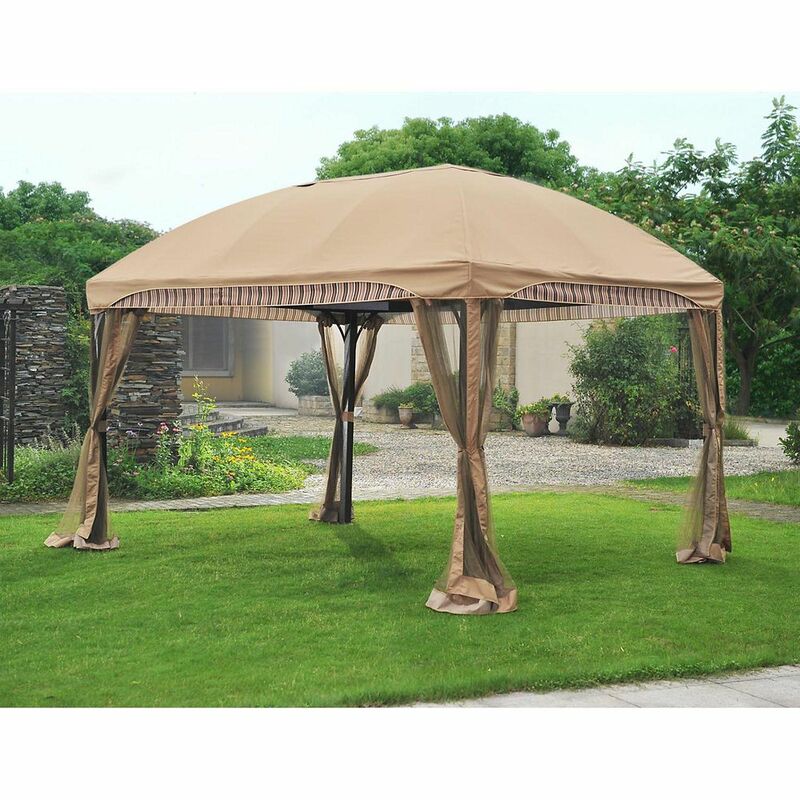 Your guests will be treated to beauty and style with this handsome gazebo. The solar cell on the top of the gazebo charges throughout the day, powering LED lights that add a gentle ambiance to your evening gathering. This gorgeous garden structure is topped with a water- and UV-resistant polyester canopy for 100 sq. ft. of coverage, offering ample room for dining or lounging. Expand your outdoor living space with this attractive and affordable oval gazebo by Monterey. Crafted from select tight-knot cedar, this piece includes a metal cap and wooden finial for a finished look. It also features decorative spindle styling and can be stained and shingled to match your home. Expand your outdoor living space with this attractive and affordable round gazebo by San Marino. Crafted from select tight-knot cedar, this piece includes a metal cap and wooden finial for a finished look. It also features decorative spindle styling and can be stained and shingled to match your home. Second tier is not included and can be purchased separately (SKU 1000693470). Cupola is not included and can be purchased separately (SKU 1000693466). Cantina 10 ft. x 13 ft. Domed Top Gazebo Planning a party? Conceiving a cookout? Deciding to dine outdoors? Look no further than this marvelous gazebo! This gazebo's large size makes it perfect for parties or entertaining, set up a buffet underneath and you've now got an excellent place to mingle. Or pack the ample space with comfy outdoor lounge furniture and enjoy cocktails, coffee or a casual brunch in the fresh air. Cantina 10 ft. x 13 ft. Domed Top Gazebo is rated 4.0 out of 5 by 2. Rated 3 out of 5 by Grasshopper1 from Easy set up Easy to set up, I manage to set it up by myself but would be easier with a helper, the canopy is easy to set up by yourself but again would be easier with a partner. I only give it a 3 stars for these reasons: 1. the canopy only last one summer and need to be replace for around $160 2. if its windy the walls and screens will come off the hooks all the time. 3. the frame is solid and will resist to high winds... 4. really nice with the high dome sealing... 5. I would recommend this dome gazebo to any one..